Well there wasn’t much sleep going around the night before our first day on the road. I definitely didn’t think either of us had done enough prep. I had exactly 178km on my new bike and Tim 113!!! Still our very experienced cycling friends kept telling us to chill. Why practice when we’d be doing the real thing for the next 6 or 7 months. And then there was the weather. Right up until 5am on the day we were leaving, there was pelting rain and screaming winds. As I tossed and turned I could only imagine what we would be like by the time we arrived in Rockingham, approximately 50km south of Perth. We stacked up the bikes and were a little dismayed that neither of us could lift the back wheel any more. How the hell were we going to get these tanks up the next hill, let alone with a headwind. We hadn’t weighed anything. 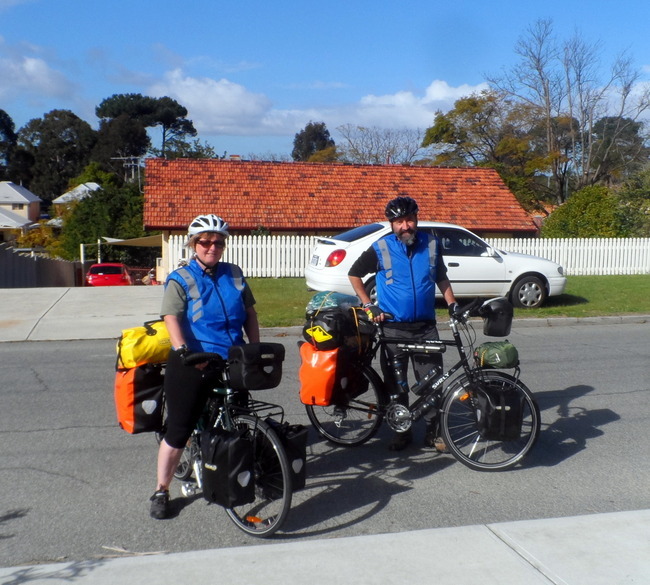 We’d rationalised what we were taking and although that might change as we get to know what we can do without, there wasn’t much to be gained by knowing how much we were carrying. 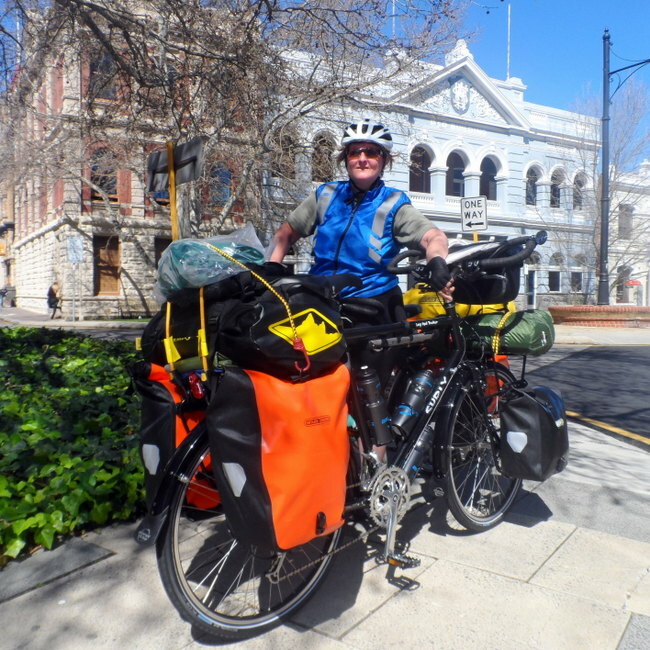 At an estimate, we reckon the bikes plus gear was around 35kg. That was with just the three bidons on the front topped up. That would increase by about 10kg once we had all our water reservoirs filled for the Nullabor. We were buoyed by the friendliness we received along the way. It seemed that everyone wanted to give the two middle aged, overweight adults on fully laden bikes all the encouragement they might need. I could feel the “Good on you’s!! !” in every smile and wave. 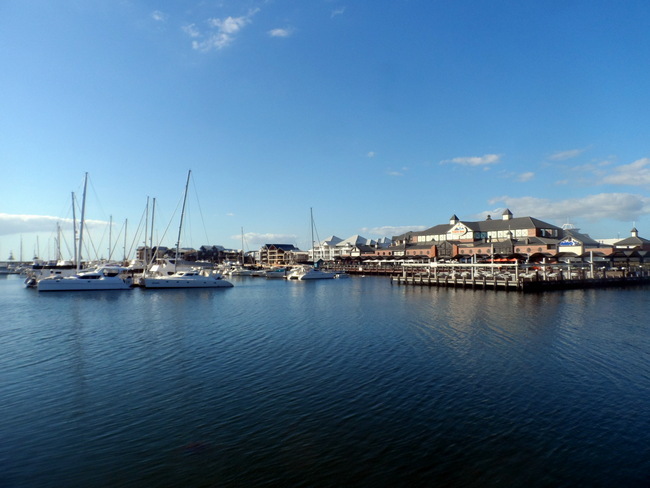 About two hours later and we arrived in Freemantle. The sun was shining, the breeze was light and we were high on adrenalin at the fact we were on our way and everything was going just fine. 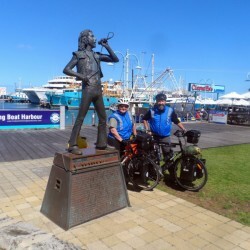 We had a quick photo down at the harbour with the Bonn Scott statue (of ACDC fame) and said a little prayer that we weren’t on the “Highway to Hell”. It was then time for a rest break over coffee and ice cream. This was definitely not going to be the healthiest cycle tour ever done but we never intended it to be. We figured we deserved a few treats now and then and there would be no skimping on fuel. Every time we stopped the bikes and gear attracted lots of admiration and everyone wanted to know where we’d come from and where we were going. There were a few startled looks when we told them this was day one on the way to Brisbane but no-one had a negative word to say about our plan. I’m sure there were a few people that were totally unconvinced we were going to make it but no-one was willing to put a dampener on the mood. After wolfing down several hundred calories we headed off on the cycle paths through to Rockingham. 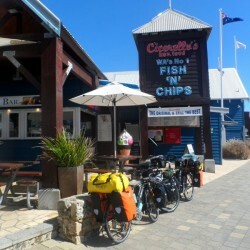 The first part was done on a coastal bike path but we then had to do a bit of time on the main road. It was a little unnerving but they had a pretty good shoulder and the traffic was fairly light. We turned off the main highway and the traffic declined significantly. This road took us all the way into Rockingham. 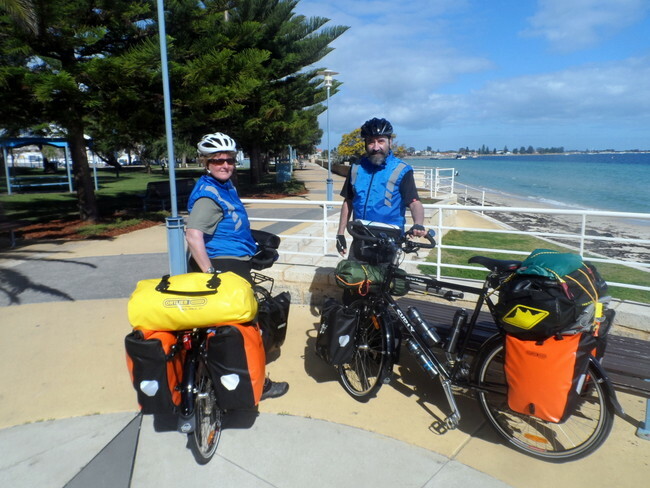 We were starting to flag a bit but we had a few strategic breaks with mandarins and muesli bars and arrived in Rockingham before 3pm at 58km’s. We couldn’t believe we’d come that far on our first day and were both still walking!!! Our first stop was Tourist Information. The lovely Nicky couldn’t have been more helpful. 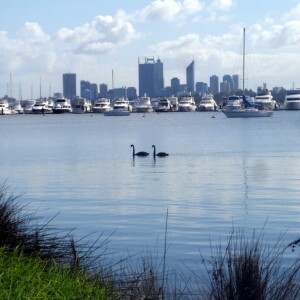 Unfortunately the campground (Palm Beach) we had chosen didn’t do tent sites, despite their online advertisements and the only option for our tent was the Rockingham Holiday Village, about 4km from the centre in the direction we’d just come. Nicky let us park the bikes in a secure area while we went for a bit of a shop for dinner and rang to confirm there was space for us out at the Village. That all sorted and we headed back out to camp. We set up camp for the first time. Everything we have with us scrunches up or packs away to the smallest possible volume and we weren’t totally familiar where everything was. In no time at all we had the tent up and the tarp totally chock full of bits and pieces. We set up the chairs…our mattresses converted to comfy recliners and sat back and revelled in the fact that we’d both made it…..64kms at an average of just under15kmph. We’d cycled an extra 17km than we thought we were up to according to the GPS (which we hadn’t followed) courtesy of the winding bike paths and a couple of wrong turns. We were a little sore but both still walking and that had to be a bonus. Now we just had to back it up the next day. It took us a full two hours to make a couple of cups of tea, a saucepan of burnt oatmeal and then clean and pack up…I’m sure (at least I HOPE) we’ll get better at the whole process. Back on the road the bums were feeling a little tender but the legs felt just fine. It was just over 40km according to the GPS best estimates but that wasn’t via the bike paths we were advised to take. At least the sun was shining once again and the wind was light. It was a beautiful ride down the coastal path as it wound in and amongst the dunes. It continued for over 15kms before we had to get onto a main road and mix it with the traffic. Thankfully it was light and the shoulder quite wide. It was, in fact, a marked bike lane almost all the way. Not long after this we spotted a Red Rooster sign and immediately decided that we both absolutely, positively had to have something to replace the failed breakfast. Hunger and craving beat good nutritional sense once again! As we road into town we came upon the first camp site we’d chosen (The Belvedere) and quickly decided to seek an alternative as it was a little far from town, had few trees and looked to be full of shabby permanents. We didn’t know if the next campground would take tents; so many of them didn’t anymore; but we figured we’d ask. Timber Tops campsite is really near to town and has great facilities. Mary, the proprietor laughed at us and gave us a tent site for $20 just because she thought we were mad. 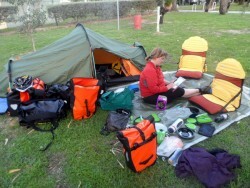 It wasn’t actually a tent site; it was set up for a van; but she was happy to let us have it because she was enthused about what we were doing….. And the bonus on top of that was that she was happy to lock up the bikes overnight because Mandurah had a bit of a reputation for bike theft. We could walk around and see the place without fretting that Sakura and Radmila might get pinched. Mandurah is a place that has clearly been a friend to the developers. “Venetian Canals” and the Marina were a testament to what a LOT of money can do to a sleepy seaside village. Definitely some million dollar plus yachts in the harbour and the real estate looked to be in 7 figures as well. We popped into the trendy looking Oyster Bar. The oysters were tempting and obviously a local specialty. The Hall of Fame on the back wall was testament to their popularity… One guy had eaten 10 DOZEN of them in less than 10 minutes!!! However, after our Big Rooster for morning tea, we were still pretty full and just wanted an icy cold beer. They were serving pints of Heineken for $8 and that was enough to convince us to park our butts and enjoy the view. After a couple of pints, canned tuna and rice didn’t have any appeal whatsoever for dinner so we decided to grab some fish from the shop to have with a Greek salad we’d been carrying. That plan failed when the fish shop was closed so we settled for sharing some Chinese. The food budget ($20/day) had been totally blown out of the water once again but I’m sure we’ll bring things back into line once we get out of the built up areas and our appetites adjust. Sleep came easier that night with the bikes locked up securely and a couple of pints in our tummies. Still feeling remarkably well, we decided to try for Binningup on the third day. 83 kms or so would be a brand new record for us but we were hoping that we were up to it. That would give us a short 30km the next day into Bunbury in time to watch the footy finals and then have a rest day on Sunday to watch the big Carlton v Richmond match. This is Tim’s team v my team so the fall out could be interesting. The route basically took us down the main highway but there was meant to be a bike path or lane most of the way. We were plotting our routes using Google Maps and the “on bicycle” option. This tended to guide you towards quieter roads and dedicated bike lanes where possible. Unfortunately most of the last half of the ride was on highway 1 but that couldn’t be helped and we prayed for a wide shoulder. We opted for a “Quick” and early departure, content to find breakfast along the way rather than get out all the cook gear. After a wrong turn we made our way out of town on a bike path, on the lookout for the first cafe to fuel up for the day. Breakfast constituted a meat pie and coffee each at the local Bakers Delight. It had worked on day 1 so who were we to buck the system. The first part of the ride was either a dedicated bike path or a nice wide shoulder and the traffic wasn’t too heavy. We stopped at the parking bays every 10 or so kms after the first 30. The butts were a bit sore from the cumulative ride and our hands were feeling the strain, going completely numb at times from the pressure. There were a few nice long hills that had us reaching for the lower gears. This was the first time we’d really hit the rises and the bikes (and our legs) performed remarkably well but it definitely was an effort on our parts. It was pretty sunny and we were conscious of getting enough water down. We’d only filled the bidons on the bikes (3 each) and that started to be a bit of a problem as service stations were few and far between. We came to the junction where we entered onto highway 1. Already tired we realized we were now going to be mixing it with the Big Boys. The semi trailers were ripping it along, as were the 4 x 4’s and caravans. It was Friday afternoon and everyone was getting away for the weekend. We finally came upon a service station about the 68km mark of our journey. Both the nerves and the bodies were a bit frayed so we pulled in for a well earned break. The turbulence when you’re passed by a big rig going at 110kmph and towing 3 trailers full of timber was a bit freaky and we were really glad we had a heap of weight on the bikes. A road bike would get sucked in and spat out no problems. Tim still had the energy to find the local shops and grab a couple of beers. We rustled up a quick meal of rice and rissoles and bedded down for the night feeling pretty damn satisfied with ourselves. If we could do 85, the first big 100 couldn’t be far away. Unfortunately we had to go back out to the main road to get to Bunbury. Fortunately it was only for 5.5kms before we could turn off onto the road that ran beside the Leschenault Estuary. We pumped along for the first bit trying to shorten the experience as much as possible and then slowed it down once we were away from the hideous traffic. It had clouded up but the rural scenery along with the birdlife in the Estuary was just lovely. A cloak of peace and relaxation descended up on us and we soaked it all up. Wouldn’t be long now and we would be out of the built up areas and into the wilds. The suggested path on Google maps had about 23 turns for the whole journey. 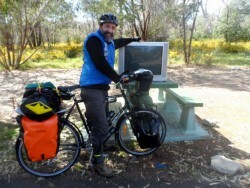 Tim had written them down and when we hit Bunbury we zig-zagged in amongst the back streets until we found the Bunbury Glades Caravan Park. What a find. Lovely grassed sites, BBQ areas with kettle, microwave and toaster, a pub and shops just down the road and free wifi. All for $25/night (unpowered). I did the washing while Tim went to the pub to watch the last quarter of the match and get some supplies for dinner. The first 200km had been challenging but a rip roaring success in our opinion. We were happy for the rest day but keen to plot out the rest of our journey. Two thumbs up for you both. It is so beautiful in that neck of the woods. 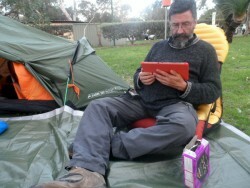 I’m impressed that you have the inclination to write after riding and then setting up camp. Well done! Keep up the great work because it is a truly inspirational ride and read. Thanks Cath. We are loving just the challenge of it all. I’m sure it won’t all be beer and skittles but that’s what makes life interesting. Hope to catch up early next year.